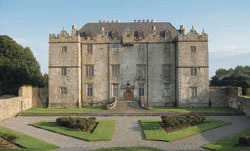 In late February 1888, Hurlbert traveled from Cork city to Portumna in western County Galway, in the Irish Midlands. He stopped in Parsonstown, noting its ancient (and present) Irish name of Birr, from St. Brendan’s Abbey of Biorra. The American reporter described the town as “a clean prosperous place, carefully looked after by the chief landlord of the region, the Earl of Rosse,” a peerage of the Parsons family, and thus the town’s name in the 19th century. 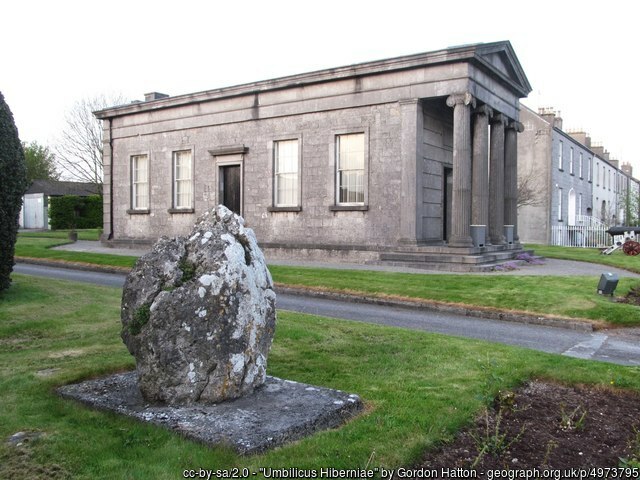 This historic limestone boulder in Birr is referred to as the ‘Navel of Ireland’ and is often considered to mark the center of Ireland. Hurlbert also mentioned that Sir William Petty called the place Umbilicus Hiberniae, or the “Navel of Ireland,” in his 1650s Survey of Ireland, since it was believed to be the center of Ireland. Other references to this nickname date to the 12th century. The true geographic center of Ireland is actually 35 miles to the north, in Carnagh East townland, County Roscommon, near Altlone. The town straddles the River Shannon and also includes portion of County Westmeath. NOTES: From pages 249 to 257, of Ireland Under Coercion: The Diary of an American. This entry was posted in Business & Environment, History, IUC, Revisted and tagged Birr, County Galway, County Offaly, County Roscommon, Parsonstown, Portumna on April 11, 2018 by admin.